You know, I was dreaming of spring, of fast, light, cotton knits. Thinking about what I can do with the lovely cottons I’ve got. Wondering how to construct a top out of the Aurora like the one that I’ve got in my mind…along with a skirt to match. Then old man winter rears his head again and dumps another 10 cm of snow. Oh well, gotta knit the woolies while you can, right? I’m actually rather impressed that I’ve resisted the urge to cast on for some sort of new project, and I’m sort of past the craving now. I’m just about up to the toe decreases on the Lorna’s sock, and am making good headway on the yoke of the Retro-Prep. 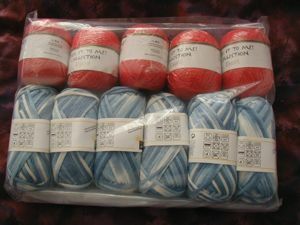 So there will be some FO’s in the near future – about time! I did some blog housekeeping – updated my FO gallery (I’ll hopefully be working on that soon, make it a little more user-friendly) and put up a link to the top-down pattern. 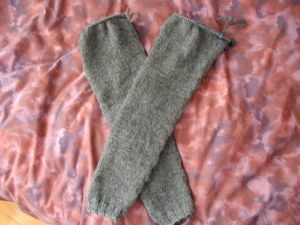 I’ve been getting hits from the Knitter’s Review Forums, where someone nice posted a link to my pattern! 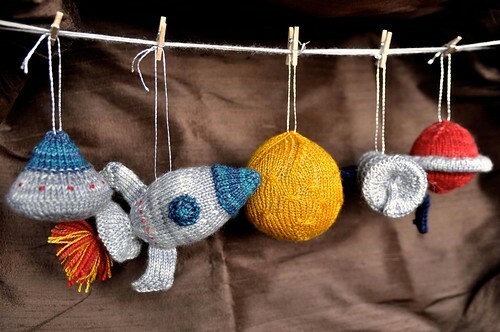 Ok, the new Magknits is up, and you what? It’s got some AWESOME patterns! I haven’t really liked much up until now (except Donna from the last issue) but nothin’ but a shirt by Alison is just perfect. And Cold Shoulder by the oh-so-talented Stefanie is fabulous. This makes my Calmer want much stronger. So expensive to buy here – maybe online. After school ends. Both of the Retro-Prep sleeves are finito. I’m just working on the last few inches of the body, then I’ll put allllll those stitches onto one needle and do the yoke. Getting closer! The Ruby is a nice, true red. 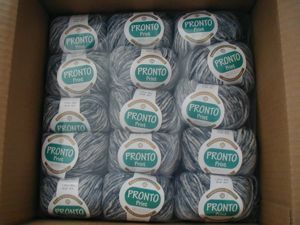 I also got some Pronto – the askew ball is the one I took out of the package. Having a meltdown re: school, so I’m going to a movie tonight. I’ll take the Lorna’s sock in the hopes of getting up to the toe!